the world. They are the face of the U.S. Air Force -- your Ambassadors in Blue . . .
Airmen voluntarily serving America and defending freedom." 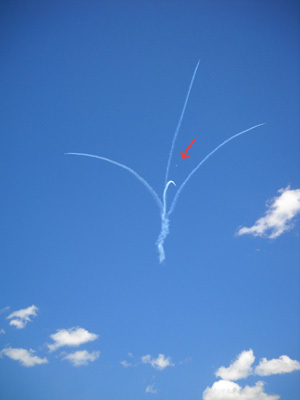 Jim is one of those millions of people who have witnessed a Thunderbird aerial demonstration since the team was formed in 1953. He got to watch them when he was in the Air National Guard in Springfield, IL back in the 1980s (when he moved to Billings, MT he served in the Army National Guard). 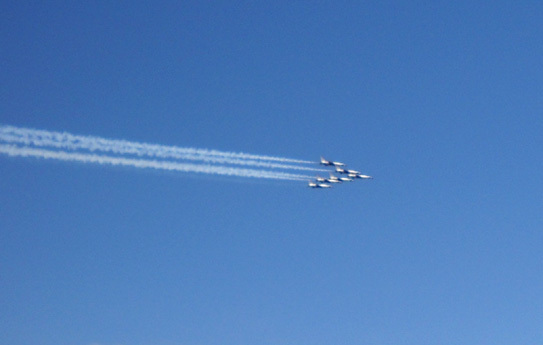 Although I have watched various air shows live and on TV before, I've never seen in person what is surely the world's best aerial team in action until this week: the Thunderbirds. It's been a long while since Jim saw the group perform; he was just as excited as I was to see them. They are still using F-16s in their demonstrations but the pilots are probably different than the ones who flew when Jim saw them over twenty years ago! Ya think? Per the website and graduation program, "The team is comprised of selected pilots assigned to the Air Combat Command and demonstrates the coordination, discipline, and flying ability that combat-capable pilots require to fulfill their vital role in our nation's defense." 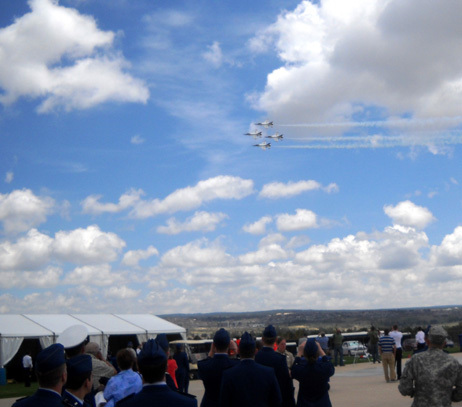 The welcome page states that the Thunderbirds' goal is for each person who sees the team in the air or on the ground to "be captivated and overwhelmed with a powerful sense of pride in America and its Air Force." In my case, they succeeded. 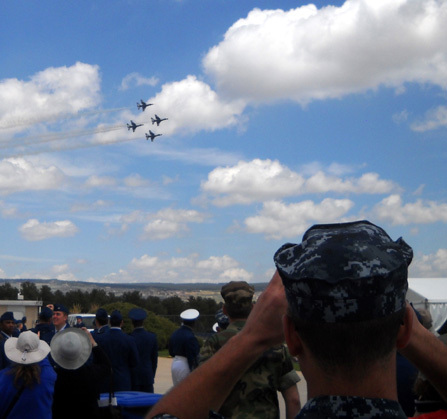 It was a thrill to see them practice yesterday and present their air show at the conclusion of the cadet graduation at the Air Force Academy in Colorado Springs today. 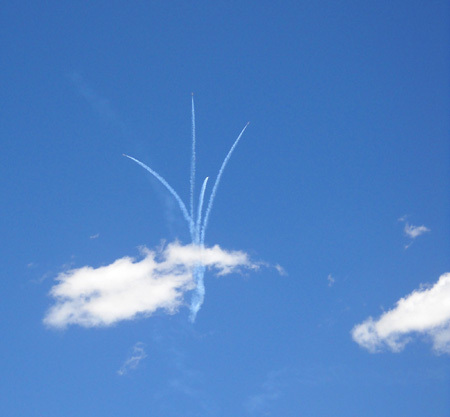 Several A-16s soar upward after leaving a heart-shaped smoke pattern in the sky during practice on Tuesday. I was in for more of a treat than I imagined. 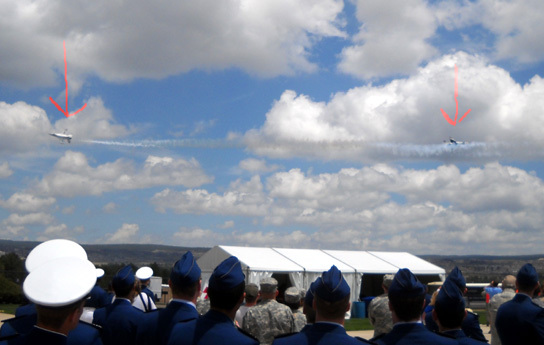 The Thunderbirds are at once daring yet graceful, totally captivating to watch. Each time they (rapidly) flew out of sight to regroup, we turned our heads in every direction to figure out where they'd be coming from the next time. They flew in so fast, they often surprised us. It's a wonder I was able to get as many pictures of them as I did. 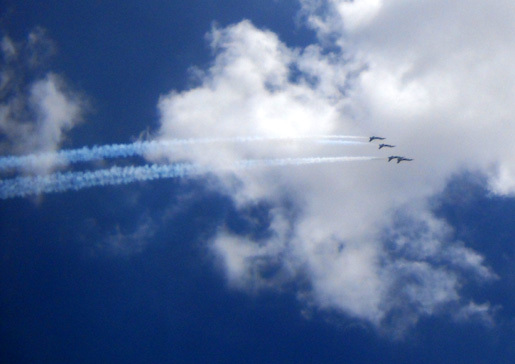 I couldn't get enough of the Thunderbirds. Both days I was disappointed when the show ended. Gimme more! WADDYA MEAN, WE HAVE TO LEAVE?? One of the first things we were told when we checked into the FamCamp at the academy on Sunday was that we'd have to vacate the campground and nearby roads for several hours on Monday and Wednesday for sure, and possibly also on Tuesday. Why? It's a safety issue, Federal Aviation Administration regulations -- the roads and areas highlighted on the map we were given were off-limits to all personnel during the Thunderbird practice session(s) and graduation performance. Most of the base was open. We could stay on base as long as we weren't in the zone that was within 1,500 feet of one of the aircraft as they flew over. were clearly visible to traffic on I-25. I just shook my head when I read on the Academy website and in the Academy Spirit newspaper, "The general public is reminded not to stop along Interstate 25 to watch the performances." News stations also broadcast that warning. 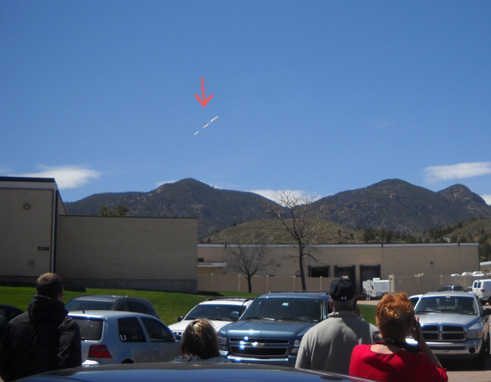 I could imagine both locals and totally clueless travelers passing through Colorado Springs screeching to a halt along the freeway when they suddenly saw the Thunderbirds in the air! Yikes. 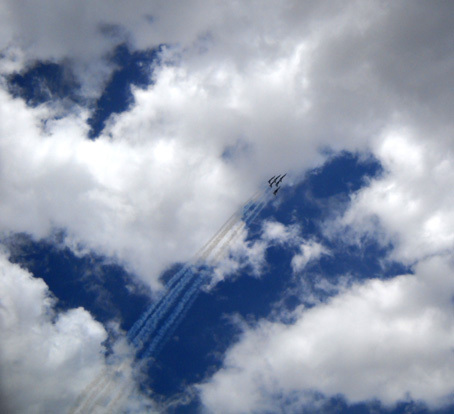 On Sunday the Thunderbirds flew from Nellis Air Force Base in Nevada, where they are stationed with the 57th Wing, to Peterson Air Force Base in southeastern Colorado Springs. 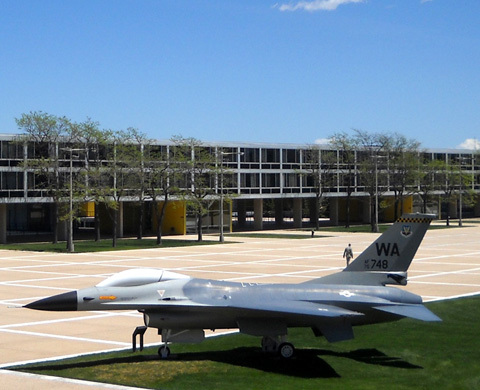 Before landing they conducted aerial surveys of the Air Force Academy. We heard various aircraft flying over the campground after we arrived that day but don't know if they were the Thunderbirds' A-16s. 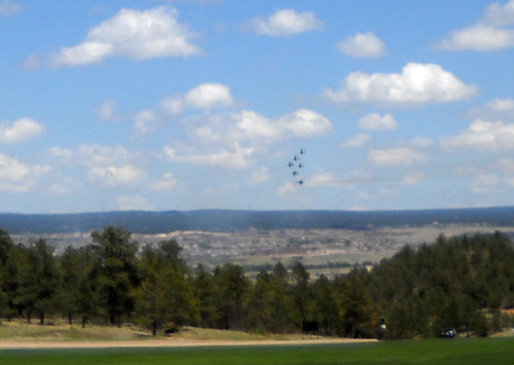 No one had to leave the campground that day or when the aerial team flew over Falcon Stadium at 8AM on Monday to rehearse their hat toss flyover. We definitely heard them that time! They were low and noisy -- not sure why we didn't have to vacate the premises then. Their first aerial performance practice was scheduled for early Monday afternoon but folks in the campground were told to leave by 11AM. We drove around the academy checking out several overlooks that were recommended as good viewing points and settled on the parking area above a slope near the mini-mall. We had to get our mail at the post office there anyway so we just hung around. We love you, too! 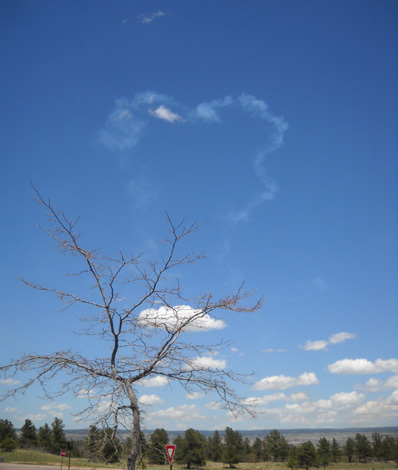 Heart-shaped smoke pattern during Tuesday's practice. Well, we sat for over an hour and nothing happened. So did some other people. About 2PM we called the campground office and discovered that the practice was cancelled due to high winds. We had wasted some time but determined that was a decent spot to sit again on Tuesday, the second and last chance the Thunderbirds had to practice before today's "real" show at graduation. We were treated to a fine show on Tuesday afternoon. 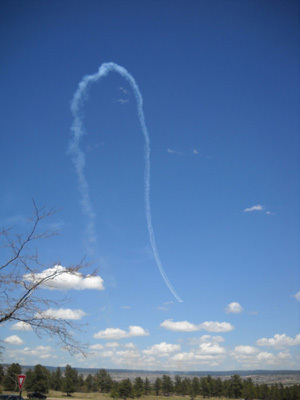 In fact, I enjoyed that practice run even more than the "real" air show at graduation. Practice lasted about ten minutes longer (~ 40 vs. 30 minutes) and had more artistry. 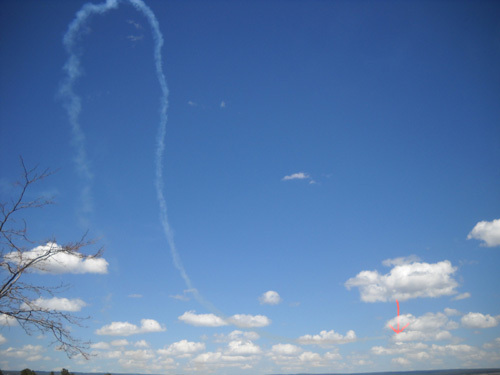 It was also easier to track the planes and see the colored smoke trails on Tuesday because the sky was more clear; the sky was pretty cloudy by the time the show began today with the hat toss. We had more company at the parking area on Tuesday. It was sorta like a tailgate party as folks gathered to watch the practice session. Our first sighting as the aircraft approached from the "rear"
Both demonstrations used six F-16s but they were all together only near the beginning and end of the shows. 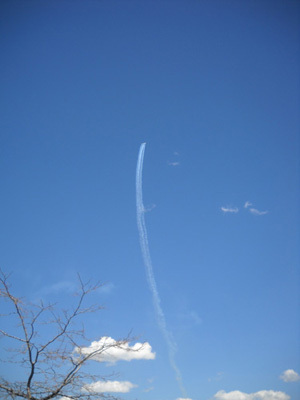 We usually saw two, three, or four of the planes at one time, and occasionally five. It's amazing how close they fly and in such perfect formation. 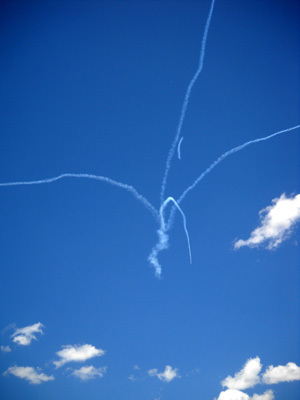 Some of the most hair-raising feats involved two or more planes coming at each other from opposite directions, often upside down or sideways (!) and just barely missing each other in front of the audience. That got the adrenaline flowing! Mine, I mean. Theirs was probably flowing, too. That's got to be an exciting job. 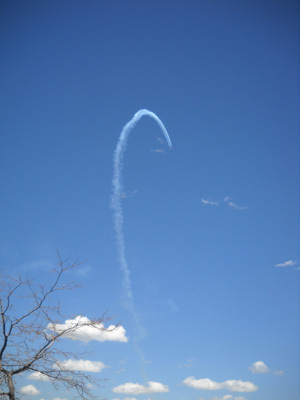 The red, white, and/or blue smoke trails the pilots often left were also interesting. 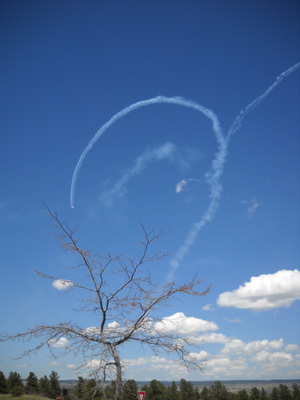 The show planes are outfitted with smoke tanks; the pilots release the smoke at just the right times to make various patterns in the sky. There were more of those patterns in practice than at graduation, probably because the clouds partially obscured them today. Here are a couple sequences from their practice run on Tuesday. I'm showing only half of the photos I got in each sequence. They did the next sequence with both four and five planes during the practice run on Tuesday but it wasn't part of the show at graduation. That must have been for their own amusement! 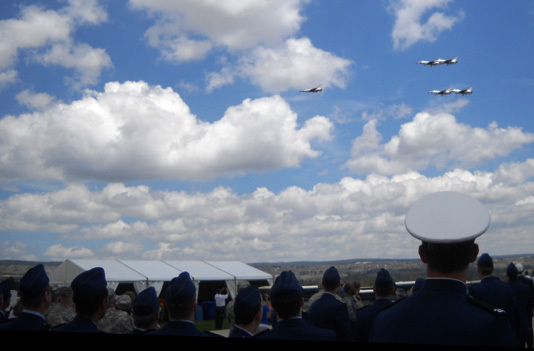 The grand finale during cadet graduation today was the traditional hat toss as the six Thunderbird F-16s flew over noisily. It was like they came out of nowhere and were suddenly overhead. They are really stealthy! See the last entry for a really great professional photo of the hat toss with all six Thunderbirds flying in formation overhead at the beginning of the aerial demonstration. I'm sure you can find others from this year's ceremony on the internet. I wasn't prepared and didn't catch the planes on camera at that moment. The photos in this section are from the graduation show, however. 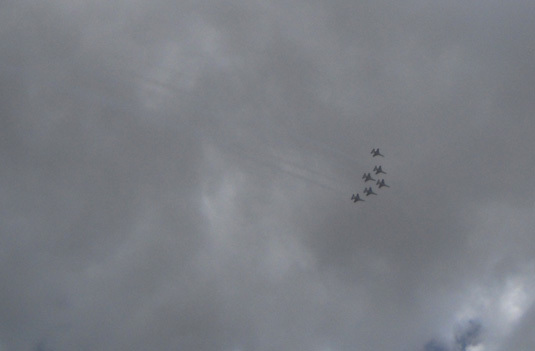 The show began and ended with all six planes but most of the photos I got were of four together. Right side up . . .
And then they were gone into the wild blue yonder. Not only is the F-16 the aircraft that has been used in the air shows since 1963, it's also the Air Force's front-line fighter. After all the trouble Jim and I had figuring out when and where they'd come into view next during practice yesterday and the show today, I can imagine how surprised and unprepared the enemy is when one of those things zeroes in at low levels! Hopefully, not all of our enemies have this technology or expertise. 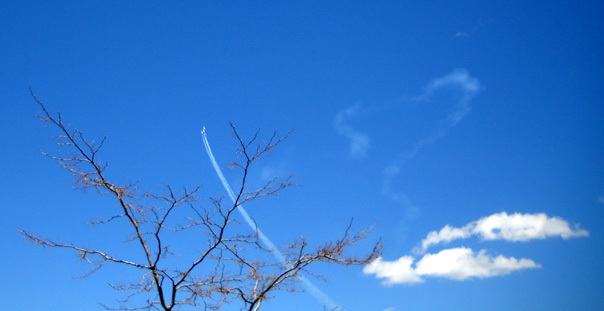 F-16s are so fast you'd think they travel faster than the speed of sound, but they don't. They are sub-sonic, not supersonic. 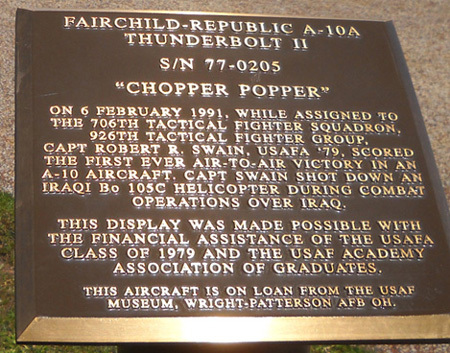 The team sometimes used supersonic F-100 Super Sabres in their demonstrations from the mid-1950s until the early 1980s, when the FAA banned all supersonic aircraft in air shows after a nasty crash. More about that below. During the graduation show today there was at least one video cam showing live pictures of the pilot(s) inside the cockpit. Pictures were projected onto the large screen at the other end of the stadium as the pilot was doing his maneuvers overhead. Wow. Jim watched the screen more than I did. I was busier trying to track the planes in the sky. Bet the pilots had great big ole grins on their faces while they were flying! You couldn't see their faces on-screen because they wear full-head helmets but it was cool to see the other planes flying so close outside their windows. 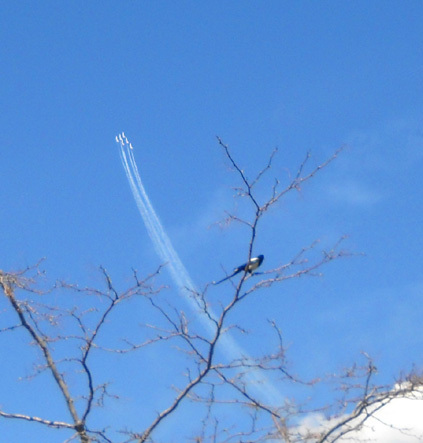 Even though the show today was shorter and simpler than the practice yesterday, it was interesting to watch some different aerial maneuvers and to see the crowd reaction. We were in a group of mostly military folks in uniform (some cadets, some older). 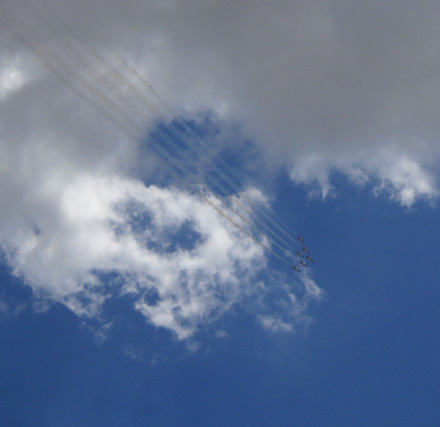 To see their pride and awe in the Thunderbird performance made quite an impression on me. I mentioned in the last entry that we moved from our assigned seats a little above field level in Falcon Stadium during the lengthy diploma ceremony to the nearest concession concourse. It was cooler, less crowded, and closer to our escape route out the gate we'd entered. We didn't stand in line to get in, and we weren't about to get behind 30,000 people leaving! Not that we could leave whenever we wanted . . . 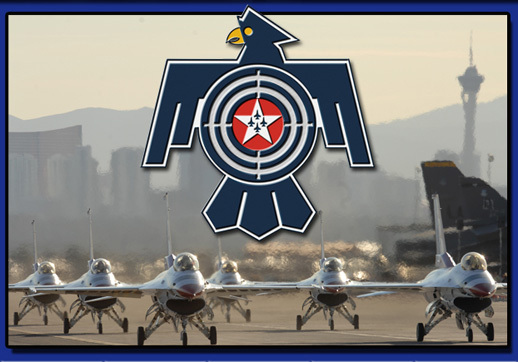 Remember the FAA rules about a certain zone on the academy grounds having to be cleared of all personnel on Monday and Tuesday during the Thunderbirds team practice? 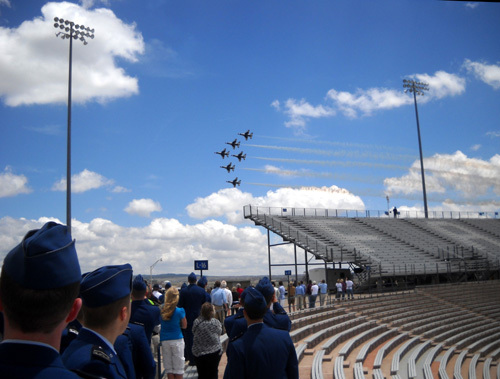 At graduation, no one could leave the stadium during the air show. More FAA rules. In fact, no one could leave until all the planes were miles away and Admiral Mullen and the "official party" left the stadium. 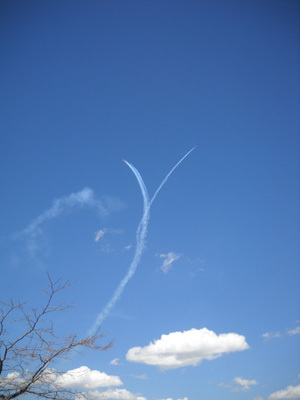 Five planes fly close to the stadium near the end of the show on graduation day. That all took a while. After the air show ended, those of us on the concourse moved toward the gates but it was orderly and sociable, not like a rowdy sporting event. Some folks in the stands remained seated or hunted for their graduates. Others filled in behind us to leave. We all waited for at least twenty minutes until the "official party" finally left and everyone else could exit. At that point we'd been in the stadium for almost five hours and we were ready to leave. Jim and I had a great time at the graduation ceremony. As we walked back to the campground we talked about all the cool stuff we'd just experienced. Jim had been a little hesitant to go because of getting sunburned and having to sit so long, but he's very glad he went. I know I'd do it again in a heartbeat, if given the opportunity. We are both proud to be Americans. We don't always agree with the political decisions being made in Washington, D.C. (regardless of the party making them), but we're sure glad we were born here and not in some other country. Participating in events such as this increases our national pride, our determination to remain as free as possible, and our support/appreciation of the people who are willing to risk their lives to serve in the military. Thank you! 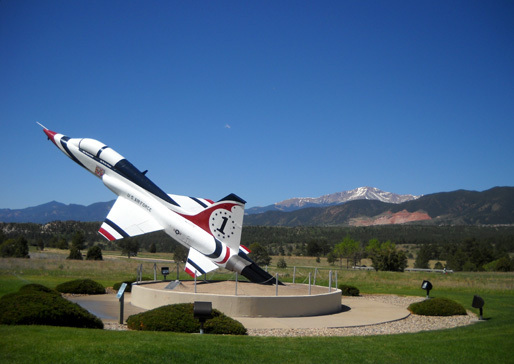 Near the south gate to the USAF Academy visitors pass the airfield and a public display of two planes significant in Air Force history: the Fairchild-Republic A-10 Thunderbolt II and the Northrop T-38 Talon. The A-10 Thunderbolt II is a single-seat, twin-engine, straight-wing jet aircraft designed and built in 1970 to meet the U.S. Air Force's requirement for a plane that could provide close air support for ground troops. The aircraft is also designed to provide significant protection to its occupants even if it receives heavy damage in combat. It's too bad the plane wasn't designed before the war in Viet Nam. 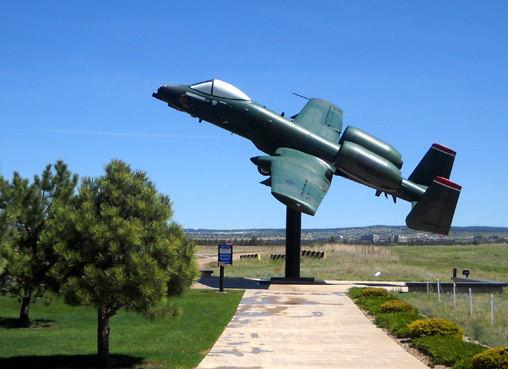 A lot of lessons were learned the hard way there that led to the introduction of the A-10. The A-10 has proven to be an effective aircraft with various upgrades over the last four decades; it is expected to be in use for many more years. You can read more about its history, design, advantages, and use in various wars at this Wikipedia site (I know, I know . . .) and other websites. 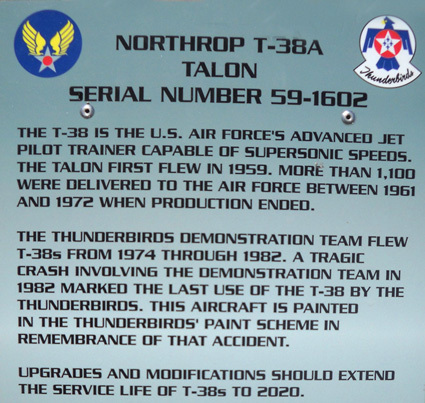 Per the Thunderbird website, the team began flying the supersonic Northrop T-38A Talon aircraft in 1974 because it was more fuel-efficient than the F-4s they'd been using for several years. 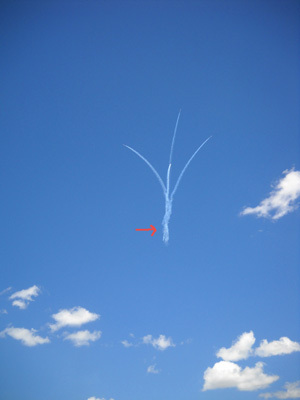 After a tragic accident during an aerial demonstration in 1982, however, the T-38 was no longer used by the Thunderbirds. The Talon shown below is on display at the Academy, with an explanation of its paint scheme. Fortunately, the Thunderbird aerial team's safety record is exceedingly good. Such crashes during practice or demonstrations are very rare. The Thunderbird team has an interesting history, including the reasons it was formed, why the name was chosen, who the pioneering pilots were, what different planes have been used, where the team has performed, and lots of other information. 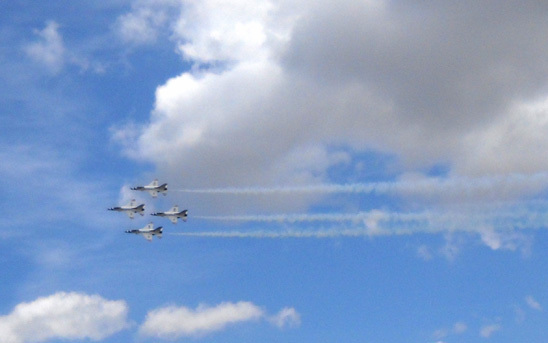 This is the 57th year for the Thunderbirds to perform. You can see who the current members of the team are and where they will perform this year -- a whopping 73 performances in the U.S. and Canada! I highly recommend going to see a show if they come to your area.